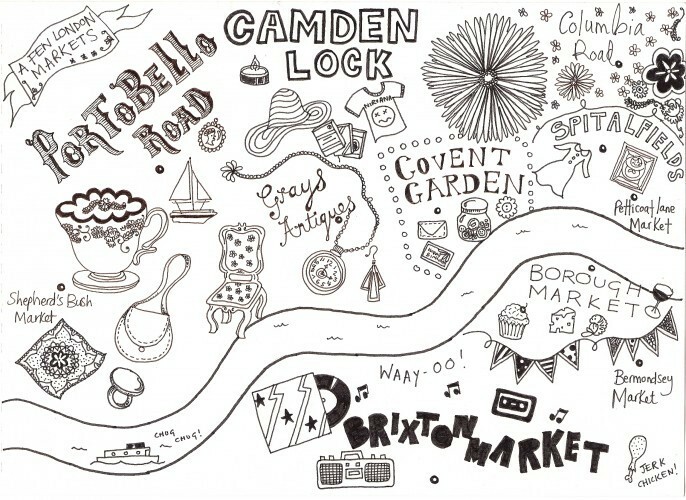 Having seen our exhibition of hand-drawn maps at the Museum of London, visitor Lauren Pegg was inspired to put together this map of her favourite markets. The picture shows characteristic items from each area: antiquey things from Portobello, musicy things from Brixton, flowery things from Columbia Road and foody things in Borough. Print it out and give it to the little ones for an educational colouring-in activity. Better yet, get your own crayons out and draw us your own map of London. We're hoping to put on another exhibition next year, so we're on the lookout for new maps. Take a look at some of the entries below for inspiration. Londonist's Hand Drawn London exhibition continues at the Museum of London until 11 September. Previously: Albertopolis, Angel to Bankside, Anglo-Saxon London, Bloomsbury, Borough of Southwark, Brixton as a tree, Central London, Central London with no street names, District Line (Wimbledon Branch), Docklands, Driver's Mind Map, Family History, Fleet Valley, Hackney, Hampstead Heath, Honor Oak Park, Hoxton Square, Isle of Dogs, Kingsland Road, London as a grid, King's Cross and Islington, Ladbroke Grove, London firsts, Mayfair, Mayfair Squares, New Cross, New Cross (the fields of), Notting Hill, Paris versus London, Patchwork London, Pimlico, River Fleet, Primrose Hill, Rivers, Shoreditch, Stoke Newington, Stratford, Toilets, Tottenham to Aldwych on bike, Tube from memory, Walthamstow by mother and daughter, West Hampstead, Westminster kettling.